The black comedy-mafia version of Swingers, our two leads from that movie are back at it again, and this time it’s a much more serious version of a low level gangster film. This is a dark black comedy that definitely appeals to a certain kind of humor. Black comedy is one of those genres that is definitely not for everyone, since the audience is basically cringing while also laughing at the same time. That being said, if you enjoy black comedies, (think Wes Anderson movies or Coen Brothers movies,) then this one is pretty funny and entertaining. It’s like a companion piece to Swingers, with both Favreau and Vaughn playing a variation of their characters from that film, and then watching how society might have changed around them. 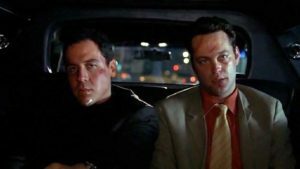 So Vaughn, for example, is still a confident loud mouth, only this time society sees him as an idiot, whereas in Swingers, this was considered charming. And the story has the two friends going to New York to take care of some business for a gangster, where they have no idea why they are being sent there, or what the business is. They are just told to go and wait for a phonemail. The premise is simple, but it works. And the humor is definitely there. 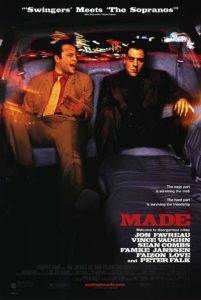 Made is a pretty funny, pretty dark black comedy. It’s a movie that stars John Favreau and Vince Vaughn, and is very much an alternate universe version of Swingers. What that means is that in many ways you can look at this as either the same characters from Swingers, only now 5 years later, (and boy have times changed,) or you can look at it as alternative versions of those characters. John Favreau’s character is still the quiet, depressed type, only now he’s got rage and power to back it up (as opposed to whiny complaining.) Vince Vaughn’s character still has all the confidence in the world, only now society views him as an annoying idiot who doesn’t know when to hold his tongue. These new versions of the characters (and to be clear, they are not actually playing the same characters from Swingers, but it sure seems like a variation,) works. The opening scene shows the two of them boxing, walking around each other in a ring, surrounded by a less than interested audience. This audience boos, yells insults, and even throws things at the boxers. Meanwhile in the ring, Ricky (Vaughn,) keeps trying to taunt Bobby by pounding his chest and motioning for Bobby to come at him. And Bobby, who is actually trying in the fight, takes these taunts as insults. Ricky is trying to put on a show, and Bobby wants none of it. He’s there for the money and nothing else, and he’s all business. From here we see the characters working at a construction site together, where they don’t exactly know what they’re doing. Ricky, in particular, is a mess. This movie doesn’t go for cheap laughs to show us this, like having things fall apart in Ricky’s hands, or having him knock things over, but instead refers to the dialogue and realistic actions of the character. For example, Ricky thinks that he’s entitled, and so he picks up the phone of the house, with the owners right there, and makes a personal call. And Ricky is berated for these things by the foreman at the site. That gets the foreman into a conversation with Bobby where the man tells Bobby that he can’t keep Ricky on anymore. Especially not if Bobby leaves. And suddenly the relationships are very clear. Bobby is the serious, more mature one. And he’s always looking out for Ricky. He has been his whole life. Including now, where he tells the foreman to keep Ricky on until Bobby can find his friend something else. So at this point, we think we know where this movie is going. The two will keep driving each other nuts until it eventually leads to the inevitable fight, where Bobby will say he’s sick of taking care of Ricky like he’s a kid. They will go their separate ways and then come back together in the end. Nope! None of that. This movie goes against the usual cliches to give us something that doesn’t fit into any familiar box. And that’s a very good thing. Instead of continuing onto the next low level job, and watching Ricky screw things up at one place after another, we stick with Bobby, who has s story of his own. It involves his stripper girlfriend, Jessica, (Famke Jansen,) and her young daughter, Chloe. Bobby is the driver and bodyguard for Jessica. He goes with her on her gigs and watches to make sure the men she is dancing for don’t get too friendly. Only there’s a problem. The other girl who Jessica goes out with is much more open to doing wild things. And seeing this makes the men think they Jessica is too. And so as the night goes, one guy gets way too friendly with Jessica, holding her head down, and Bobby jumps up and knocks the guy out. No more driving for him. No more going on calls with Jessica. Now we meet Max, his employer, and he’s got a new job for both Bobby and Ricky. It involves taking a briefcase to a certain meeting. All they know is that they are going to New York and then waiting for a call, where they will be given further instructions. And the limited amount of details they are given starts to get to them. Are they being sent to NY to get whacked? Both guys wonder it, and Ricky even proposes that they should get guns. While the setup itself, about how these guys have no idea what they’re doing in NY, is funny in itself, it’s their interactions with people who come across their paths that is especially funny. Vince Vaughn knocks it out of the park as Ricky, striking a nerve with everyone he comes across. There are two scenes in particular that are most certainly alternate versions of Swingers scenes. Both involve Ricky trying to pick up women. In the first one, he and Bobby are on a plane and Ricky calls the flight attendant over and tells her when they land, she should get a friend and come hang out with them. In Swingers, we got this same scene with a cocktail waitress at a Vegas casino. Only there it worked. This time, in Made, the scene results in the woman telling him off for being so disrespectful. And the other scene takes place in a hotel room when Ricky actually does get a girl to come with him into the back room. In Swingers it was taking a tour of the mobile home, which led to a make out session to the song “Magic Man,” by Heart. In Made, we go done the hall after Ricky and the girl he brought home, played by Jennifer Esposito. We find them in the bathroom, with Ricky in the tub and Esposito sitting beside it. And then she comes running out, screaming and crying about how she used to take baths with her boyfriend. The two girls leave and the guys are left there in the room, alone. Very different than the Swingers version, where Vaughn was the stud and Favreau was the guy interrupting his friend and the girl, in order to check his messages. This time it’s Vaughn who just screws everything up. And aside from the fun they try having in New York, (they are both given a large amount of spending money for the trip,) they are there to do business. Which means they have to take meetings at clubs and restaurants with Ruiz, Sean, P. Diddy, Combs. These two are involved in something that they don’t quite understand, especially Ricky, who seems to think it’s all fun and games. And yet he’s also the one who keeps insisting they need to bring a gun, whereas Bobby trusts Max completely and wants to go there, get the job done, and move on. The movie works because of its characters. Both Favreau and Vaughn are playing right in their wheelhouse. Even in Swingers, where Vaughn’s routines did work with women, you could see the dynamic of Favreau’s character constantly getting frustrated with his friend. So imagine it here, when Vaughn’s outlines don’t work. When Bobby constantkyvgas yo cover for, mske excuses for, or find jobs for Ricky. It’s funny. And it has a nice, exciting climax too. The only thing that doesn’t quite work as well is the mid section of the movie when these characters are basically hanging around New York with nothing to do. They are just waiting, and so are we. They don’t know what their mission is, or why they are there, and this portion could have used a little more pizazz. For example, the two women who they brought to the hotel room… who were they and how did they get there? We’re they call girls or just women they met at a bar. A little more of that would have gone a long way. But for the most part the movie works. The humor is there, and the characters are fun. Black humor isn’t for everyone, but if that genre works for you (if you like the movies of Wes Anderson and the Coen Brothers,) then this movie works too.